Alex has the qualifications of a Bachelor Rural Science (Honours) and a PhD from the University of New England and is a fellow of the Australian Rural Leadership Foundation. 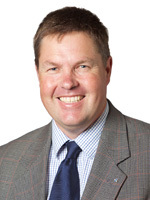 Alex joined Meat Livestock Australia (MLA) in 1997 and has held roles such as National Manager for Sheep Genetics, Sheep and Southern R&D, Southern Production and Program Manager of Eating Quality and Lean Meat Yield R&D. Currently Alex is the General Manager of Strategic Innovation within MLA. Alex maintains an active interest is R&D publications and is the author of three book chapters and over 50 refereed journal articles. Alex is also currently a wool, sheep and beef producer in the Tenterdin district of Guyra NSW running fine wool sheep and cattle.